If there is one thing you need to know about Anushree Reddy. It is that the designer almost never deviates from her signature style. 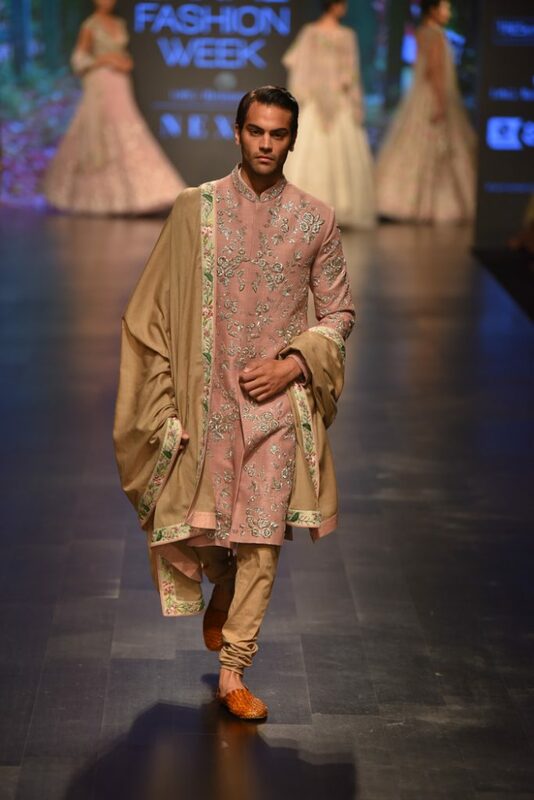 This time Anushree Reddy LFW 2019 Collection saw a host of summer lehengas, some grooms-wear outfits and some semi festive wear. 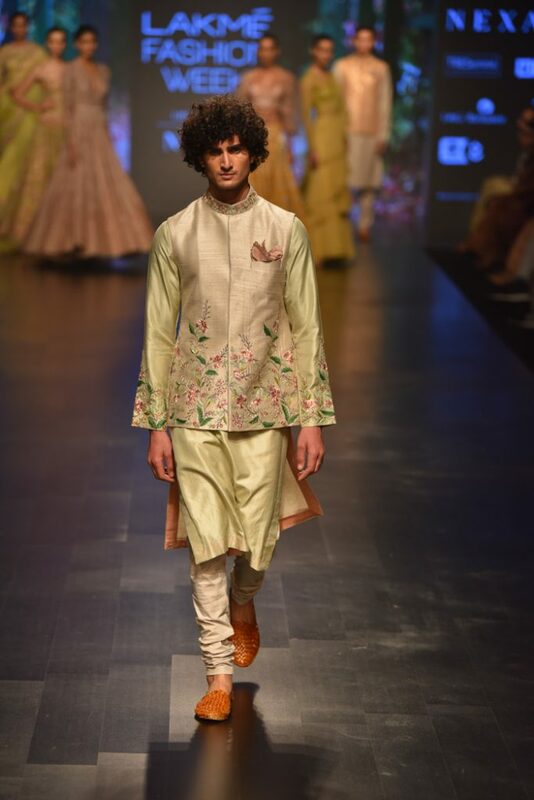 Anushree Reddy LFW 2019 Collection titled ‘Atirah’ is inspired by flowers and perfumes. The colours in the collection were not the usual pinks and reds. But one can see a lot of deep blues, peach, light pinks and some yellows in the outfits. Gone are the days when you could buy an Anushree Reddy Bridal Lehenga for under 1-1.5 Lakhs. The designer definitely has upped her price range. All of the new Anushree Reddy LFW 2019 collection outfits are priced above 1 Lakh with bridal pieces touching close to a whopping 3 Lakhs. Get married soon ladies, coz lehengas are not getting affordable anytime soon! I guess two lakhs is the new magic number starting this year. But come to think about it, makes sense. Now even the ‘premium’ Chandni Chowk lehenga stores are charging more than 1.5-2 Lakhs for their exclusive bridal pieces. The collection,’Atirah’ paid an ode to the ancient tradition practiced in Kannauj, famously known for extracting oils from flowers to make heavenly scents/attar since the Mughal empire era. 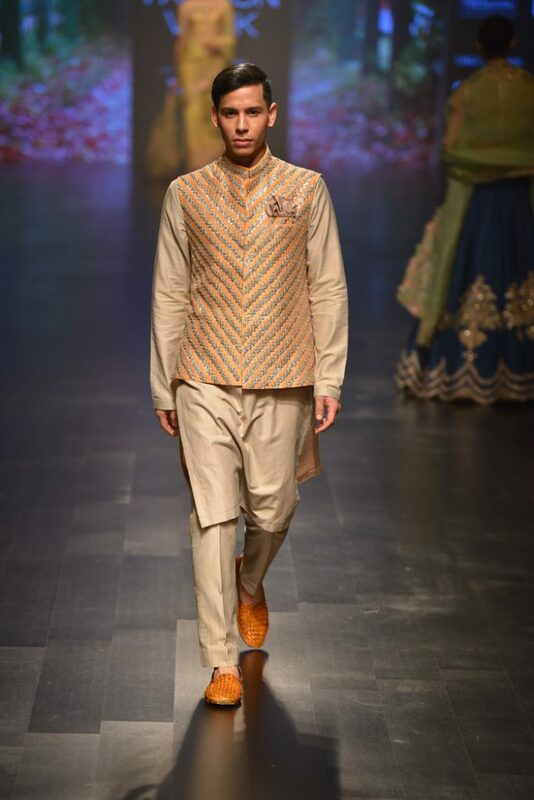 The colour featured hues of Fiza(Celestial blue), Zar(Warm apricot), Sang Raza(Frosted almond). 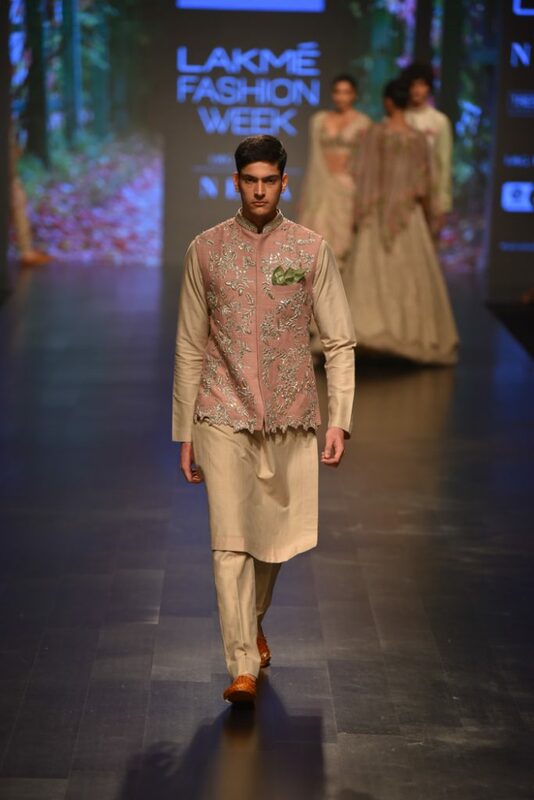 The underlying tone of the entire collection was based on the ancient saying, “Ishk or Mushk Kabhi Chupta Nahi He” which meant “love and musk are impossible to hide for long”. 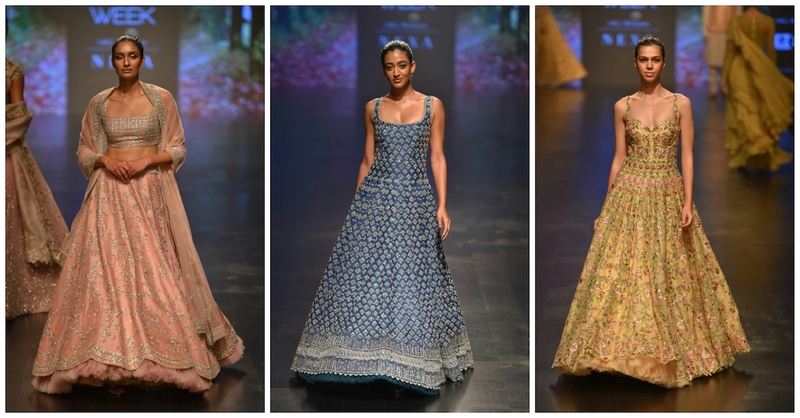 The only thing that looked new and fresh in Anushree Reddy LFW 2019 collection were the Anarkali gowns. Although a bit on the expensive side, these gowns can easily be picked for the sangeet night party. All three Anarkali gowns are different in their look. You can even pick it up for a sister of the bride/groom look for the main wedding. 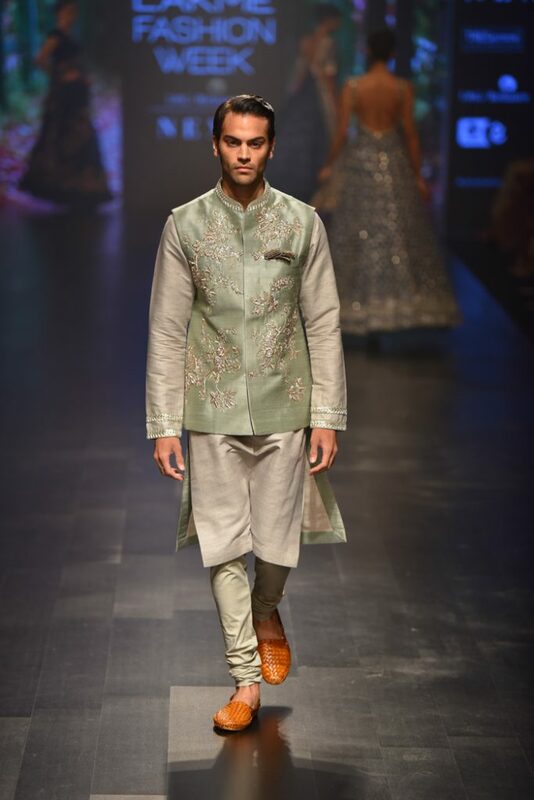 If you are disheartened by the new Anushree Reddy LFW 2019 prices, don’t be. Her previous year collections are still very much in. You can easily pick one of those within budget. Take a look at some of the blog posts with her previous collection pictures and prices.